By Dave Winer on Sunday, July 29, 2012 at 2:50 PM. People used to make fun of the politician who said the Internet was basically a bunch of tubes. This always bothered me because he was right. That's exactly what the Internet is. Lots of tubes and over those tubes flows lots of ideas, very very fast. 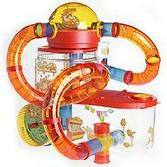 To companies like NBC and Facebook, and to some extent Twitter, we're not tubes, or people, we're hamsters in cages, spinning wheels. When NBC reports on what's happening on Twitter, they talk about how many millions of times the name McCartney appeared vs how many people said something about the Queen or Bond or Mitt Romney. They seem to miss what people are saying about them. They should try to listen. That's the good stuff. Look at the number of clickthroughs one of my bits about NBC got last night. That's some kind of record. I have bad news for NBC. On Twitter, they're the story. Not the Olympics. Meanwhile the athletes get involved. Same in tech, I think -- the talent understands what a medium is. The suits still think in terms of how many times the wheel spins. Maybe the athletes think that too, maybe they just do a better job of faking it. Doc Searls said something interesting. He's not a range of ages -- 18-54. We're not coveted age groups. We're people with hearts and minds and lives and ideas. We don't use these things so much to make your wheels spin, rather to get a thrill about using something very futuristic, and wondering how it might evolve. I think even the newest Twitter user gets a lift from the possibilities. NBC had a chance to make sports exciting in some incredibly interesting ways. And all they think of, instead, is how to keep people from doing that. It's the saddest story in tech, and it's one that just keeps repeating. In any case, the news system of the future keeps booting. Everything we said on Rebooting the News is still true. And we're still experiencing a lot of friction between the old way and the new way. Change doesn't come easy! © Copyright 1997-2012 Dave Winer. Last update: Sunday, July 29, 2012 at 3:10 PM Eastern. Last build: 7/31/2012; 3:40:50 PM. "It's even worse than it appears."